Jose Baez & Casey Anthony May Soon be an Item, If They are Not Already! 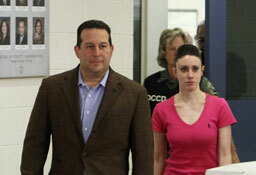 casey anthony was released from the County Jail earlier this morning, with her savior/attorney Jose Baez at her side. Baez was a Loser before this Trial and then became an Attorney. He will Never be able to Duplicate the ‘success’ he had with this trial. The trial was a ‘Circus,’ and everything fell into place for Baez. Clients will hire him at first, if he chooses to continue being a trial lawyer, but the cases won’t have the outcome he had with anthony. Baez probably realizes this, and if anthony hasn’t already, is already trying to snare Baez as her paramour, Baez no doubt has been, or has lured anthony. Baez is as shrewd and conniving as anthony.